Along with Anthony Miller, Michael Gallup is the other wide receiver prospect who is flying a bit under the radar but offers good value if you don't want to reach for one of the top five at the position. He's a big bodied physical receiver with some burst and an ability to naturally separate from defenders. Gallup initially attended a junior college out of high school, and showed great promise with a 780 yard, 11 touchdown freshman year. He was limited by an ankle injury his sophomore year, but was still taken on by Colorado State. This was a wise choice by the Rams. Gallup put up huge stats in his debut season, to the tune of 1,272 yards and 14 touchdowns. He was equally productive his senior season, scoring less but becoming even more active in the offense and putting together a 100 catch year. 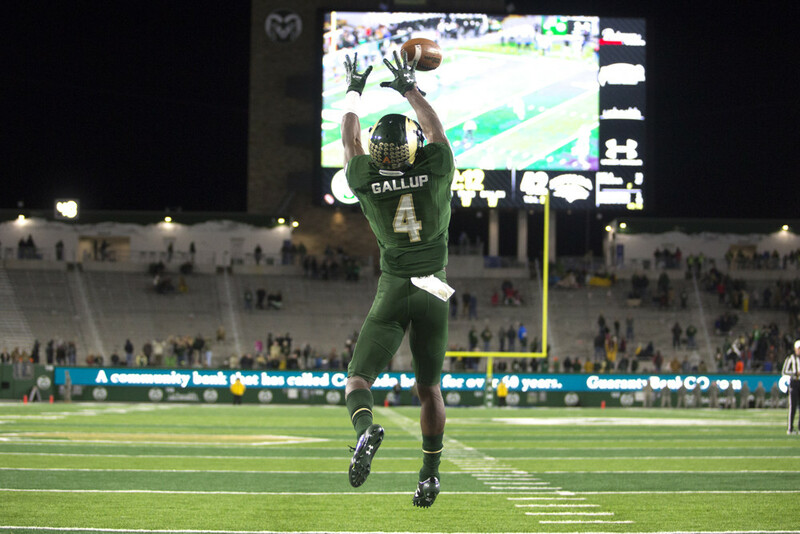 With Gallup continuing to develop, his upside is very enticing and he could provide big returns as a dynasty pick. Near ideal size for an NFL WR#1. Speed is great, especially when combined with size. Also is deceptively fast, has an effortlessness to his acceleration and top end speed for separation. Extremely tough to press. Is quick in and out of breaks and can get separation without having to rely solely on his size. Quick feet for a big kid. Is unafraid after the catch, has good instincts and can power through tacklers. Good vertical to win high balls and above average body control. Still raw and ran a condensed route tree. Rounds routes and doesn't always end up in the right spot. Deep ball tracking is a work in progress. Had some inexcusable drops and concentration on every down isn't quite there, especially when he wasn't the first option. Was not competeing against top tier defenses, only had a small sample size against Alabama and he was up and down in that game. Will need to refine his game overall, but development can be seen on film, especially from Junior to Senior year. I really liked what I saw from Gallup on film. He's big and physical but has natural talent at the position and absolutely dominated last year, even if the competition wasn't the best. Even more interesting is he is still raw, and has room to improve his route running. There was noticeable development from 2016 to 2017, so if he can continue his trajectory in the NFL, he has the physical tools to be a future WR#2 or even WR#1 if he maxes out. However, he will likely be a stash prospect, not an immediate impact. You will have to be patient with him, which may scare off other owners in your league.